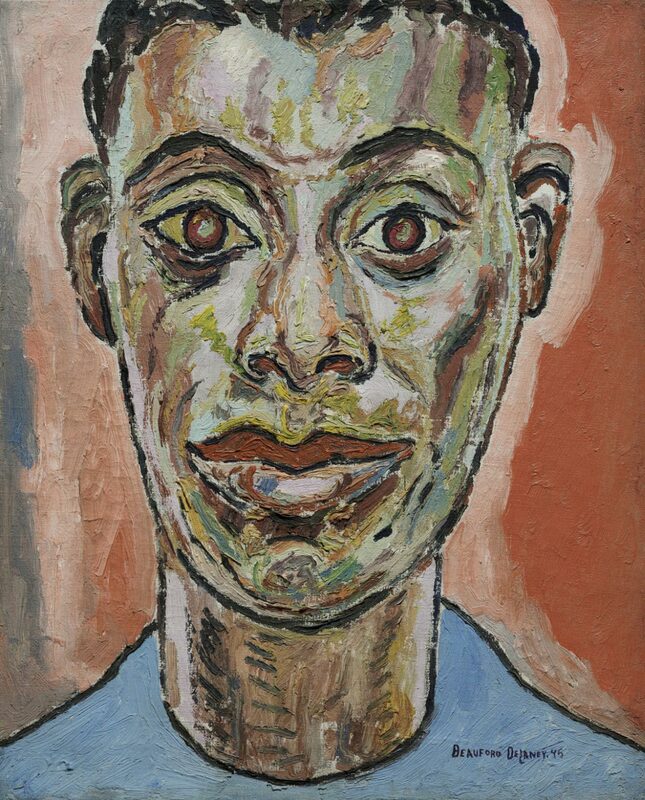 This iconic painting is a very early depiction of the famous writer and civil rights activist James Baldwin, who was twenty-one when Delaney created this portrait. Closely cropped and vibrantly painted, it jumps out from the canvas, presenting an up-close encounter with the sitter. As in Delaney's self-portraits, he painted one eye slightly different from the other, a pictorial device also found in Pablo Picasso's paintings. Of the many portraits Delaney made of Baldwin, this one is among his most direct and expressive. After growing up in Knoxville, Tennessee, and attending art school in Boston, Beauford Delaney arrived in New York in 1929 in time for the rich stimulation of the Harlem Renaissance. He soon became a popular and respected figure among uptown artists and musicians, Greenwich Village bohemians, and the circle of artists centered around the midtown gallery of Alfred Stieglitz. Both his cityscapes and portraits of this period reflect his joy in this dynamic milieu as well as the bold innovations he brought to traditional genres of oil painting. This portrait of James Baldwin was made when he and Delaney had only recently met, and the aspiring writer was just twenty-one years old. The intensity of the image recalls the portraits of Vincent van Gogh, whom Delaney revered. The piercing eyes, the strongly defined nose and lips, and the trunklike neck give Baldwin the unforgettable presence of an icon, as does the close-up viewpoint of the composition. The daringly juxtaposed passages of raw color radiate with the energy of the mind and heart of this young man, the future author of such novels as Go Tell It on the Mountain (1952) and Giovanni’s Room (1956). Baldwin, who later wrote eloquently about Delaney’s paintings, would call the artist his “principal witness.” The term could be understood literally: over the course of the next thirty years, Delaney portrayed Baldwin in at least ten drawings and paintings. In the 1950s they both joined the growing circle of African American expatriates in Paris, where they remained lifelong friends. Delaney’s move to France explains in part the belated development of his reputation in the United States. In the company of the Museum’s portraits by artists such as Thomas Eakins, Henry Ossawa Tanner, Mary Cassatt, and Alice Neel, Portrait of James Baldwin powerfully affirms Delaney’s distinguished contribution to American modernism. Ann Tempkin, from Philadelphia Museum of Art: Gifts in Honor of the 125th Anniversary (2002), p. 109. James Baldwin and Beauford Delaney first met in downtown New York in 1941. Delaney was a forty-year-old artist whose cityscapes and portraits had recently achieved their first mainstream acclaim. Baldwin was only sixteen years old, a troubled high-school senior who had been advised by a friend to seek out Delaney as a source of advice. The two developed an instant rapport and Delaney introduced the future writer to the worlds of music and poetry as well as art. When they both eventually joined the growing circle of African American expatriates in Paris, the role of guiding spirit reversed. Baldwin served as a notable advocate of Delaney's painting and an invaluable friend during the last twenty-five years of the older man's life, a period when he was plagued by mental and physical illness. Delaney viewed Baldwin as a spiritual son, and Baldwin later would call Delaney his "principal witness." The term could be understood literally: over the course of the next thirty years, Delaney portrayed Baldwin in at least ten drawings and paintings. Baldwin's many eloquent descriptions of Delaney's work call attention to the uncanny power of light in his paintings. In this commanding portrayal of 1945, the face of the twenty-one-year-old man shines forth from the canvas like a beacon. Its intensity recalls the portraits of Van Gogh, whom Delaney revered. The piercing eyes, the strongly defined nose and lips, and the trunk-like neck give Baldwin the unforgettable presence of an icon, as does the close-up viewpoint of the composition. The daringly juxtaposed passages of raw color create a palpable electricity emanating from the mind and heart of this young man who would create such major literary achievements as Go Tell It on the Mountain (1952), Giovanni's Room (1956), and Another Country (1962). Philadelphia Museum of Art: Twentieth Century Painting and Sculpture in the Philadelphia Museum of Art (2000), p. 84.